October 16, 2016. This movie. This band. That necklace. Life changing. Life giving. Life saving. Every time I try to convince words to take a journey from my brain to the paper, tears threaten to make seeing the words impossible. In an attempt to share even a fraction of the significance of this event, I will break down the event and all the moving parts into little bite-sized pieces. 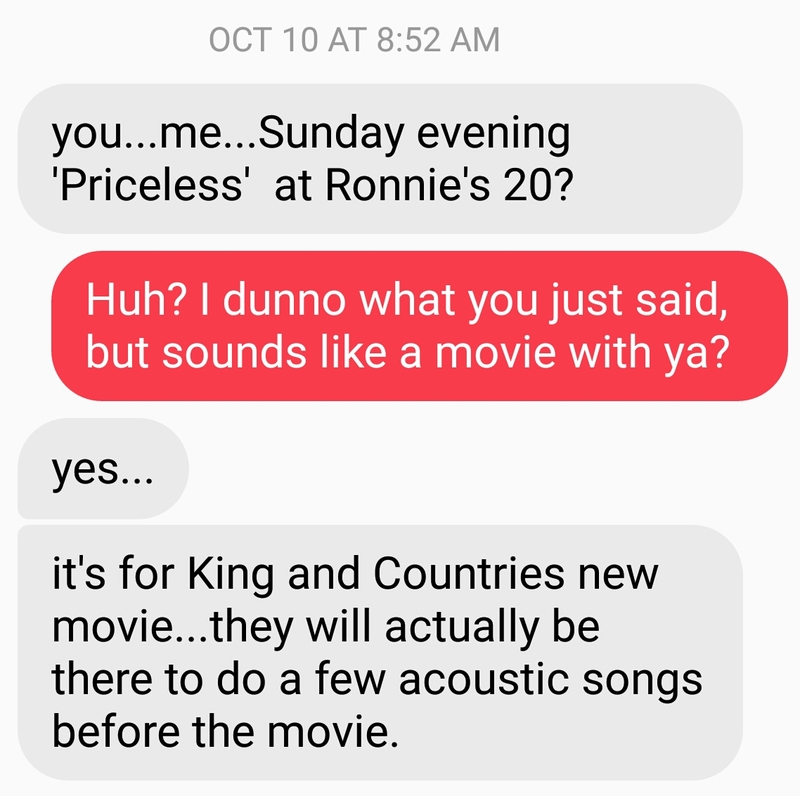 you…me…Sunday evening ‘Priceless’ at Ronnie’s 20? So, this being a friend who I love and trust, I basically blindly said yes. She knows me. She gets me. What’s more, though? She allows me the honor returning the favor. I’m grateful. Alas, I accepted her invitation, and nearly canceled several times. But I didn’t. As this day approached, the excitement and even anticipation grew. It made me happy to learn that the band would be in the theater live, playing a few songs for us. Their flight was a bit delayed, so the acoustic set was after the movie. So, this movie is incredible. This is part in fairly certain I can’t get through without my tears going on mass exodus. Again. 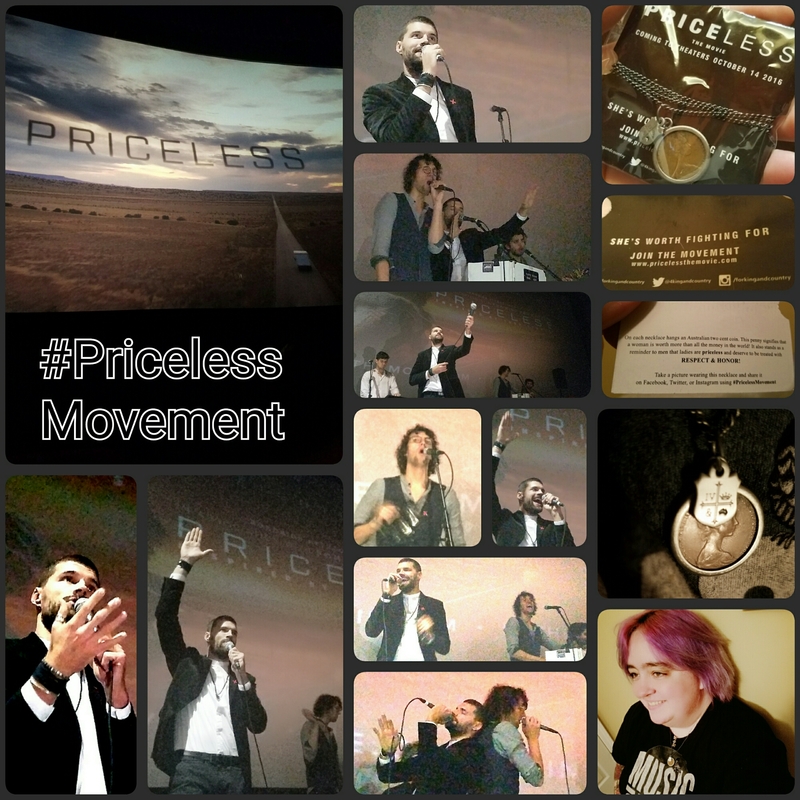 So, instead, I’ll ask you to click on the following link, and watch the trailer for Priceless. I will say this though. This movie and it’s storyline broke my heart. Mostly because it’s no joke. People, this stuff happens. It’s real, and it’s in our backyards. Don’t get me wrong. I loved the movie, those that produced it, and all who came together to make it happen. It was tremendously well done. I found a surge of emotions at varied times throughout the entire thing. It was beautifully painful. It hurt, and it healed. Most of all, it was God’s heart in a movie. God’s hand holding my shattered heart. The fact that God can use a movie to touch some very deep and dark places is testament to the fact that the whole experience (more to come on that) acted as a healing salve applied to some wounded places. After the movie concluded, the band took the stage for a few minutes. They sang/played a handful of songs. Again, the heart of God, in human form, stood before us on that theater stage. The words of their songs grabbed my heart, and didn’t let go. I can’t begin to count the number of times I wiped tears from my eyes. At one point, Joel, from 4 King And Country, looked directly at me. He smiled as if to say, I see you. You matter. Your pain matters. In truth, he probably thought nothing of the sort, but in that moment – God’s grace, His love, just held me. At one point, they polled the audience to see if anyone was confused as to who they were, and why a band was live on stage in a movie theater. One person responded. They welcomed her, and asked us all to say hello. Joel picked up a necklace – the one you can see me wearing in the picture above. He spoke about its meaning and significance. The words “She’s worth fighting for” just melted my heart. As he spoke, he looked at me again and reached down and handed it to me. Yes, of course, tears streamed down my cheeks. I’m nothing special, but in that moment, God’s love and grace swallowed me whole. It was as if God Himself was giving me a much needed hug. Joel doesn’t know my story, but something (that small voice, like in the movie perhaps?) urged him to share it with me. To give me a gift. A necklace. It was more priceless than any gift could have been in that moment. You see, it showered me with God’s love. I felt important, and as if my life has meaning. God used that moment to hold me. To help me see glimpses beyond the pain. It helped me feel hope in tangible ways. It helped me just breathe, and know I’m loved. I wanted to share this for a multitude of reasons.Mostly to share my own gratitude. To my friend for inviting me. To Joy FM for whatever part you played behind the scenes to help this event happen. To 4 King and Country for the hearts you had in creating this film, delivering it to the public, and the life-giving mini concerts you allowed His heart and presence to touch others with. And especially to God, for not giving up on me, and for allowing your love to penetrate some shattered and somewhat dark places. Please don’t ever throw up your hands and realize I’m just too much. And to all reading, if you might be in pain, know that you are not alone. I do not have to walk your journey to understand that you hurt. I think we all do in some way, shape, or form. I see you, but more importantly, God also sees you – exactly where you are if I could say one more thing, it would just be to not give up. I want to see that your life has value and worth, and you still have purpose here. I needed these same reminders yesterday, and they flooded my heart with love and healing. If you need similar reminders, here they are. Someone, please just point me back to this page, and my own words when you see or feel the need. Know that you’re not alone. It’s okay to not be okay, and it’s okay to reach out. Just don’t give up. There is still time for good things to happen. There is time for hope to surprise you. You are not out of time, and neither am I. If you’re hurting, just take my hand, and allow me to sit with you – even virtually – in this pain. It may be real, but it will not be forever. You will come to know more than the pain that tortures you. You matter. Your story matters. You’re worth so much more than you can comprehend. Please, keep giving hope a chance to surprise you. You are loved. The topic today is pretty personal, but one I would imagine many people deal, even struggle with. It is with that thought process that I would like to share a pretty neat experience I had today. Let me back up for a moment. As I have been sharing, our church is doing a series that talks about loving recklessly – learning to love as Jesus loved. It conquers the idea of an us vs. them complex. In said scenario, no one is perfect – with the only exception being Jesus. So, with that said, it is His commandment that we love one another. I’ll be the first to tell you – this is NOT always an easy feat. I will now fast forward to today, with a brief background. The objective – show God’s love. To everyone. Yes, everyone – even those not easy to love. Check. If you are anything like me, there are probably a few different “kinds” of people you probably find yourself with disdain, as opposed to love for. Yes? I will be the first to raise my hand. But, thank God, this mindset of mine is changing. Through God working in my heart, I’m learning to see people and situations differently – through His eyes. Let’s explore this for a second. Love how Jesus loves. How do we know how Jesus loves? It’s simple. He does. Period. He loves people simply because they are people. He has a crazy unconditional love for us. As human beings, will we always be able to love like this? Not highly likely. Should we try? Absolutely, without a doubt. As I was out and about running errands, the individual behind the cash register was some I would have once been very inclined to say something (in my head) like, “it’s another [insert stereotypical, and likely judgmental classification here]– gosh, they’re everywhere!” I’d probably have some other mental thought process going on, and it wouldn’t have been nice. Like I said, God’s working on my heart in this (and many) area(s). Today, however, was different. I saw this individual and had compassion. I smiled and was friendly. I had that initial “it’s another [PERSON TO LOVE]” thought. I did not see them as a negative member of society. Instead, I saw them as another person to love. I didn’t do anything super spiritual. I didn’t go above and beyond. I just carried on pleasant conversation, and I allowed walls in my own heart to crumble. I was kind to this person (not that I’d ever have been mean) and I did what I could in a short amount of time to just not judge and to show love. I hope you’ll join me on this mission of loving people recklessly – even those who are hard to love. It isn’t always going to be easy, but it IS always going to be worth it. That, my friends, is what I am grateful for today. I’m grateful to see these small, yet huge, changes going on inside me. Words. They make the world go ’round. I’d like to encourage you on something that has been impressed on my heart. Your words are important. They have huge amounts of power. Your words have the power to build up, or the power to tear down. Always strive to allow your words to be authored by God, and His breath to breathe life into dead situations. Sometimes you may be inclined to think that words are just words. And, they are – to a degree. What may mean absolutely nothing to you, may be the difference of life in death to another person. That’s just the thing. You ALWAYS need to be mindful of what you are saying. Before reacting, choose your words carefully. Allow yourself time to think about how you would feel, should the conversation be reversed. Always put yourself in someone else’s shoes. If you were down, or for whatever reason, hurting – think of the kinds of words you would like to hear. Never hesitate to spread those words. Those are words filled with life, and filled with love. In contrast, if you don’t ponder how your words will impact someone, imagine the damage that can be done when you speak words in anger, or out of hatred and/or hurt. Take time to think about your reaction. The way you react may make an immense difference — but not just in the life of the person you are speaking to — it often will make a bigger impact on yourself. I encourage you to always strive to speak with love behind your words. Allow God’s heart, and His love to spread like wildfire. I’m grateful today to be able to choose words that build up, and bring life instead of tearing down and bringing the exact opposite.